The fantasy adventure Clash of the Titans, starring Sam Worthington (in photo above) earned the top slot during the Easter weekend. MANILA, April 05—Warner Bros.’ Clash of the Titans demolished Kraken-like box-office records in the Philippines as it posted a nationwide, two-day opening weekend gross of P 47.54-million for the April 3-4 period. This was announced by Francis Soliven, general manager of Warner Bros. (F.E. ), Inc. which distributed the film. The fantasy adventure loosely based on Greek mythology easily captured the No. 1 slot for the competitive Easter weekend which saw four big movies opening. Starring new Hollywood hotshot Sam Worthington (fresh from the monumental success of Avatar), Clash of the Titans demolished numerous box-office records in its path. It’s first-day Metro Manila receipts of P17.47-M last April 3 is now the biggest opening day gross ever for a Warner Bros. title (beating 2006’s Superman Returns with P16.73-M); the highest first-day gross for 2010 industry-wide; and the fifth most successful opening day in history (shattering last year’s 2012 with P17.35-M). Titans also broke the all-time opening day record for a 3D film—its haul of P9.45-M in 3D screens shattered the first-day record set by last month’s Alice in Wonderland (P3.02-M). The Top 20 theaters that posted the biggest sales are Trinoma (P2.86-M), SM Mall of Asia (P2.78-M), SM North EDSA (P2.35-M), SM Megamall (P1.87-M), Greenbelt 3 (P1.79-M), SM Cebu (P1.69-M), Glorietta 4 (P1.65-M), Power Plant (P1.42-M), Alabang Town Center (P1.30-M) and Gateway (P1.28-M). Also doing impressive business are Shangri-la (P1.16-M), Eastwood (P1.01-M), Robinson’s Galleria (P943,521), SM Davao (P939,940), Festival Mall (P929,456), Market Market (P914,846), SM Marikina (P892,448), SM Bacolod (P876,925), Greenhill’s (P875,300) and SM Clark (P863,073). In Clash of the Titans, the ultimate struggle for power pits men against kings and kings against gods. But the war between the gods themselves could destroy the world. Born of a god but raised as a man, Perseus (Sam Worthington) is helpless to save his family from Hades (Ralph Fiennes), vengeful god of the underworld. With nothing left to lose, Perseus volunteers to lead a dangerous mission to defeat Hades before he can seize power from Zeus (Liam Neeson) and unleash hell on earth. 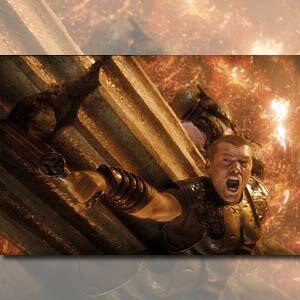 Clash of the Titans is presented in 3D wherever possible, making the gods even more formidable, the creatures even more fearsome, and taking audiences even deeper into the mythological realm of Perseus’ quest. Now playing across the Philippines, Clash of the Titans is distributed worldwide by Warner Bros. Pictures, a Warner Bros. Entertainment Company.